Shudh Desi Romance is the Title Song of the movie Shuddh Desi Romance. Shushant Singh Rajput, Parineeti Chopra and Vani Kapoor are the Starrers of the movie Shuddh Desi Romance. The Title Song Shuddh Desi Romance is shooted on Shushant Singh Rajput and Parineeti Chopra.Benny Dayal and Shalmali Kholgade are the Melodists of the song Shuddh Desi Romance. 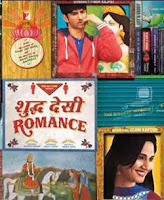 Sachin Jigar has composed the Title Song Shuddh Desi Romance while Jaideep Shahni is the Lyricist of it. You will get the proper Lyrics of Shuddh Desi Romance Title song with its correct meaning. We hope you will enjoy it. Ladki ghumayega to latt lag jaayegi..